A basic overview of local circular walks with videos and news updates on this page about forth-coming events. Route: Via Lanner thoroughfare; Pennance Lane, byway/footpath to Lanner Green and Christchurch. Finishing along the Tresavean Tramroad and Lanner byways. Leaving the Coppice from the lower car park, turn right and cross to the thoroughfare; from here continue uphill to Pennance Lane next to the Portreath Bakery. Ascend to the top of the lane, turn left onto Pennance Road near Fiddlers Green and walk towards Lanner Hill. At the hill cross the road and descend to Lanner Square; in front is the Lanner Inn; bear right here and walk to the Green and Christchurch. This is a pleasant little corner of Lanner and an ideal place to relax or even enjoy a picnic. 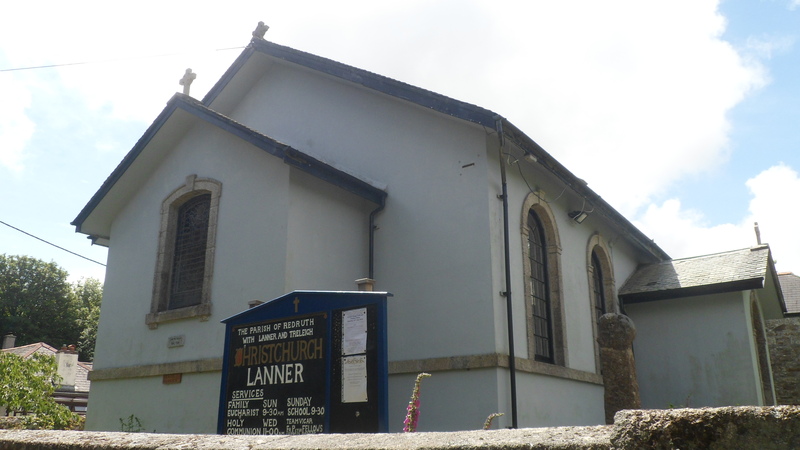 The parish church of Lanner is diocese of Truro and the county of Cornwall; it hosts many community events including jumble sales and traditional village activities. Continuing uphill from the church for half a mile, pass under a tunnel above the Tresavean Tramroad; turn immediately left after the tunnel and ascend to the tramroad. Turn right and enjoy a lovely walk back towards Lanner Moor; at the road junction take the byway on the left and descend to the thoroughfare. Turn right towards Portreath Bakery; you will pass Pennance Lane as you return to the pub for a well-deserved refreshment and hopefully the satisfaction of a lovely walk! Route: Via Carharrack (Road); then forest trail and public footpath across Gwennap Estate; follow Gwennap Pilgrimage to Comford Hill, Trevarth and Lanner. Starting from the top of the Coppice Inn car park, cross right and walk uphill through Trevarth towards Carharrack as far as the mining trail; turn left at the brown sign and ascend to Pennance Road. Turning right at the top a footpath follows the remnants of the Redruth & Chacewater Railway to the village of Carharrack. Reaching Carharrack pass the site of the old railway coal yard (also once an animal feed store) and continue to St Piran’s Church on the right. Continue through the village passing the Carharrack Stars Inn and bear right at Sparry Lane. Walk straight ahead following the byway towards the woods and turn right at the brown Mineral Trail sign. Follow the path to the entrance of Trevince Woods and take the trail on the left which runs along the fenced perimeter to Gwennap Village. The mile of forest is a wonderful habitat for native fauna which frequent this idyllic region. Badgers, foxes and buzzards are among the many species that have made the woods their home. 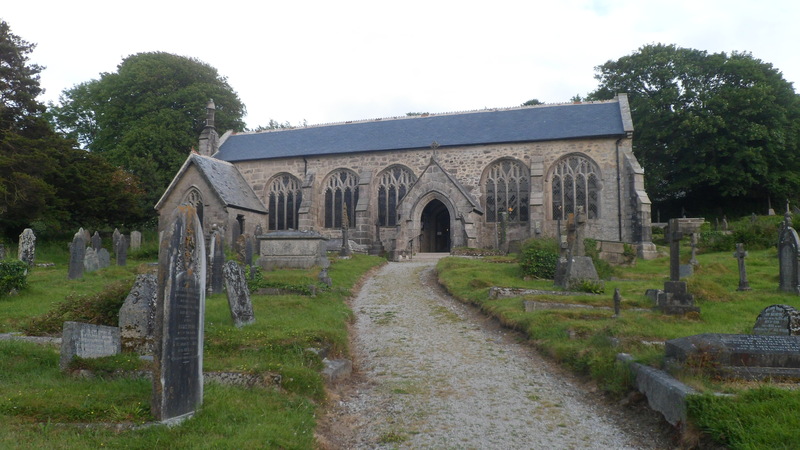 Reaching the forest exit bear right and descend along the country byway to Gwennap Village; following the stream by the road will ensure that you will capture a view of the magnificent parish church which is the centre piece of the village. Continuing along the byway towards Comford take the muddy footpath on the right and walk through the paddocks beside the estate to Comford Hill. Carefully cross the busy road and join the slim track marked with a St Piran shells slightly downhill on the left; this diminutive track runs for half a mile to Trevarth. On reaching the main road at Trevarth cross to the pavement and turn left for a half mile walk back to the Coppice Inn. Route: Via Tresavean, Thetharrup Wollas, Badger’s Farm using byway to Gwennap; Cornish Pilgrimage Trail to Trevarth and Lanner. Crossing to Tresavean Estate walk uphill to the byway as far as the tramroad junction. Do not join the tramroad; instead bear left before the junction and descend to the farm track below. The track passes the farm terrace, Lanner Football Pitch and a gaggle of geese which patrol the pastures en route to Tretharrup Wollas; beyond here follow the Blue Trail (straight ahead). Continue along the foot path to the road; bear left onto the byway and descend to Badger’s Farm; the lovely downhill walk offers some shade and at the next junctions bears left towards Gwennap. As the main road looms near take the left byway (marked no access for cars) and walk to the main Falmouth Road. Cross carefully and join the byway to Gwennap which reaches the village half a mile later. Descend through the village stopping to enter the church via the iron gates. Leaving further down at the main entrance, join the pilgrim route marked in black/yellow and walk straight ahead towards Comford. Two hundred meters along the road join the footpath on the right and ascend to the granite steps leading into the paddock. Cross the fields and follow the footpath to Comford Hill. Cross the road carefully and join the Trevarth Byway marked with a St Piran’s Shell. Walk half a mile to the Lanner Road, turn left and cross to the pavement; from here there is a gradual descent of a quarter of a mile to the Coppice made up of idyllic countryside of paddocks, farmland with panoramic views of distant Tresavean. Route: Via Tresavean, Redruth & Chacewater Railway, Pennance Road and Trevarth. Starting from the carpark cross to Tresavean Estate and walk uphill to the byway. Continue along the stone track which falls away to the right as it climbs to the tramroad. The route now evens out to make a pleasant passage crossing only diminutive lanes forming from Lanner as it takes in wonderful countryside, panoramic views and information boards loaded with details about the prolific age of mining. Tresavean peaked between 1818-1858 and was the third largest copper producing mine in Cornwall. All along the way are reminders of the past as the trail passes by old tracks, over a tunnel and opens up to views of Pennance Consols Mine and the north coast directly ahead. At Tram Cross Lane the trail turns right passing the Guest House, ‘The Old Railway Yard’ as it nears the busy Redruth/Falmouth Road. Cross carefully here and rejoin the trail at Carn Marth Lane. Now bear right towards Pennance Mine (Wheal Amelia) and join the Redruth & Chacewater Railway. This pleasant section enjoys an escarpment and is largely sheltered from Pennance Road. Half a mile into the journey the trail reaches a junction at Pennance road. Turn right at the road and walk towards Carharrack as far as the byway next to Barn House near the Lanner Sign. Now enjoy a descent along the peaceful lane to Trevarth. At the bottom turn right and continue for a quarter of a mile along the pavement on a further descent to the Coppice. Start and finish: The Coppice Inn (Can also be adapted to The Star at Vogue). 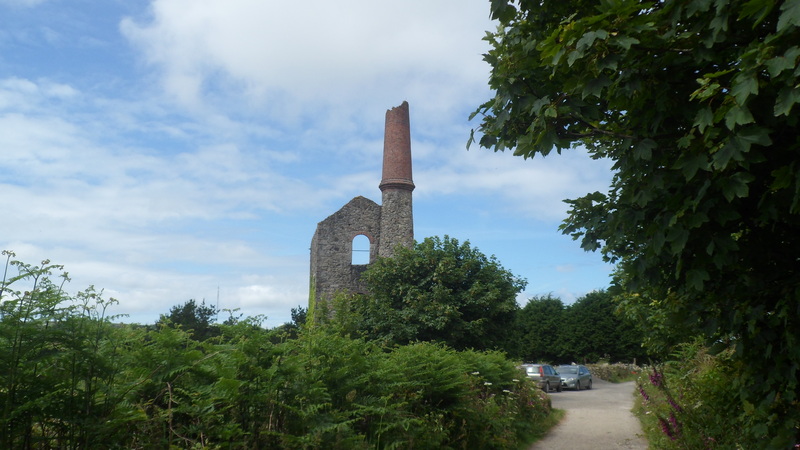 (woods via mining trail and follow round back of Sparry Lane to Route 3; walk to School Hill for St Day; Vogue Shute; footpath to derelict mine shaft; return to Gwennap pit via paddock(alpacas); use The Cornish Pigrimage route to complete. From the Coppice car park turn right and walk uphill through Trevarth as far as the mineral trail near to Carharrack. Take the right turn on to the track and descend to the Comford Road, cross carefully and enter the woods via the dirt track slightly to the left. Continue straight ahead following the trail to Carharrack entering near to Sparry Lane; from here use the mineral trail around the back of the housing estate. Eventually the path leaves the estate via the Consols Road. Turn left and walk towards the village. At the road junction bear right (marked as Route 3) and walk down towards St Day; from here you can catch a glimpse of the old church towering above the village. Cross the road at the next junction and use the footpath to St Day Hill; ascend to the village then walk the thoroughfare (downhill) to the Star Inn at Vogue. The pub is a useful halfway stop and usually open all day complete with library and internet access. Across the road Route 3 continues its course to Gwennap; as it passes Vogue Shute which in the 19th century was the water supply for the community up until WW2. Continue to the next public footpath and turn right along a farm track; through the gate and at the road walk past the derelict mine stack towering above on the left (now a resting place for owls). Walk to the bend (about half a mile) then turn left up a farm track to the paddock. Enter through the gate (left) and cross the paddock; the first field contains horses and the next is fenced to accommodate the alpacas that reside here. Cross the next stile and rejoin the road; do not follow Route 3; instead bear left towards Gwennap Pit where you can enjoy a moment in the past at the amphitheatre and small chapel. John Wesley preached at the open air amphitheatre on 18 occasions from 1776 and a service is still held at the theatre each year at Whitsun. There is also a visitor centre, tearoom and local books for sale including guides about the Gwennap /Cornish Pilgrimage walks. Leaving the site turn right and walk the Pilgrimage Route along the road to Carn Marth Junction marked in yellow/black tape. Turn right and ascend to the quarry. At the top of the quarry cross to the path opposite which connects with the Redruth & Chacewater Railway. It descends past a smaller quarry and on the approach Consols Mine locate the gravel path on the left. The path tumbles beside the paddocks to Pennance Road where the journey back to Lanner concludes along Pennance Lane; to achieve this turn left onto Pennance Road and walk to Fiddlers Green and then cross to the lane opposite. Now descend into the village exiting onto the thoroughfare at Portreath Bakery; the Coppice Inn is less than a quarter of a mile from here. Route: This walk takes in Trevarth, Gwennap, Trevince Woods, Carharrack and Vogue; it returns to Lanner via Gwennap Pit, Carn Marth and Pennance Road. Leaving the Coppice set off uphill towards Trevarth. Heading towards Carharrack take the byway on the right which leads to Comford Hill. Cross carefully at the busy road junction marked with a St Piran’s Shell and join the public footpath a few yards on. The path crosses the estate as far as Gwennap; on reaching the road turn left and walk towards the church. Continue past the estate following the lane next to a stream out of Gwennap; eventually you will see a footpath forming the entrance to Trevince Woods. Enter the forest and enjoy a scenic journey as far as Carharrack where there is a mini footpath junction. Take the left turn and continue to the road; cross and rejoin the mineral trail which leads to the top of Carharrack. Turn right at the road and walk into Carharrack passing by the Chacewater and Redruth Coal yard. After walking another 100 meters turn left towards the old Methodist Church and Carharrack Sports Club. Continue to the next junction bear right and descend along the dirt track to the Vogue byway marked as Route 3. Turn left and continue to the Star Inn. Route 3 continues along the Gwennap Pit Road passing Vogue Shute on its course to the amphitheatre. Another mile will reveal the iconic Gwennap Pit and half a mile from the site (right on exiting) you will pass the Cathedral Farm. A short walk from here join the Carn Marth footpath on the right and ascend along what is known as the Gwennap Pilgrimage which crosses Carn Marth via the amphitheatre. Reaching Carn Marth (marked by a derelict building) turn right and continue uphill to the lake. From here a mud track descends to Pennance Mine. Continue as far as the road; then cross and turn left so as to walk the thoroughfare back to Lanner. Leaving the Coppice Inn, cross the main road to the estate and join the byway at Tresavean Flats. Ascending along a gravel track pass a farm track on the left by the pony field and then join a mud track a little further on. Although wet in Winter it is accessible and takes in a small-holding of geese and the Lanner Football Pitch is nearby. On the approach to Tretharrup Wollas we encounter a few potholes as the byway passes a couple of residential properties before climbing to the Gwennap/Upper Lanner Road which forms part of a byway frequented by minimal traffic. Overlooking Lanner it remains a quiet secluded stretch lined with paddocks which are home to many local horses. Reaching Chapel Lane Junction take the sharp right and descend to Tresavean Tramroad below enjoying the wonderful views the journey affords. On reaching the Tramroad turn left and continue along the flat track. At the railway bridge descend carefully to the road, bear right and continue to Christchurch passing some of the older cottages surrounding the Green. The Industrial Revolution gave rise to the newer terraces built to suit the needs of the great mining period which saw Lanner evolve from a hamlet to one of the longest villages in Cornwall. Before this time. it existed as a modest farm community visited by ancient pilgrims on their way to St Michael’s Mount. They would have had no vision of the industrial era to come which would one day transform this little kingdom into one of the most prosperous entities of its time. After reaching Lanner Square you may wish to visit the local inn; otherwise descend along the thoroughfare back towards the Coppice Inn where the walk reaches its conclusion. Leaving the Coppice Inn, cross the main road and join the lane at Tresavean; Flats. Ascending along a gravel track pass the farm track on the left and then join a second mud track a little further on. From Tretharrup Wollas ascend to the Gwennap/Upper Lanner Road which is little more than a country lane taking in panoramic views of Lanner and providing a comfortable all-weather route above Tresavean. Reaching the Chapel Lane Junction take the sharp right and descend to the Tresavean Tramway enjoying the wonderful views the journey affords. On reaching the tramway turn right and continue along the flat track. At the next junction you will find an old railway track and placard depicting the history of the tramway which dates from the Victorian era when it was opened as part of the Hayle Railway. During the Industrial Revolution the Tresavean Tramway was entirely horse-drawn often transporting loads of coal from Wales in exchange for the copper ore from its mines. The line closed in 1936 when the rails taken up for scrap though a section still remains as a memorial to its past. Home once again to nature the trail lives on as a leisure trail with many reminders of its once great past. And like the pilgrims who traversed the region before the mining era this path provides passage for the modern day explorer; its past has helped evolve again as a modern day pilgrim route to St Michael’s Mount inspiring a new age of travel and discovery. After enjoying the all round splendid views extending to the north coast on the right and Pennance Consols Mine at the foot of Carnmarth on the high ground ahead, it is time to leave the tramroad and descend back towards Tresavean Estate to complete the circuit. Route: Via Carn Marth, Gwennap Pit and Vogue Shute. Starting from the car park bear right to cross the road and walk to the top of the village; continue by the Pennance Road turn off and join the mineral trail on the right at Carn Marth Lane. Veer left at Pennance Consols Mine, Wheal Amelia, to follow a course by the quarry amphitheatre and lake. At the lake turn right and descend to the derelict barn (200 metres); now bear left and descend to the Gwennap Road. Turning left again walk half a mile to the amphitheatre at Gwennap Pit. John Wesley preached here in the tin mining era and there is an annual service at the amphitheatre in honour of Witsun. A tour of the church and a coffee at the centre makes the visit complete and from here the journey links with Route 3 at the next junction. Turn right here and continue downhill to Vogue Shute which was once the water supply for the community until the introduction of mains feed after WW2; Gwennap Road ends 100 metres beyond and opposite is the Star Inn which is open all day as pub, library and restaurant which also does bar food at lunch times. Continuing from here take the byway opposite the Star and walk to School Hill. Locate the foot path opposite (right marked in black/yellow tape) and follow the trail to Carharrack Club; continue into the village passing the old water pump and Methodist Church closeby. Turning right walk to the old site of the Redruth & Chacewater Railway Coal Yard, bear right onto the Pennance Road and walk to Carn Marth Hill. Ascend to the top bear right along the road as far as the track on the left. The next ascent leads to Sunrise Cottage where the trail widens as it extends to Carn Marth. Cross the road and take the trail on the left which leads to the old railway and from here continue to Pennance Mine. Nearing the mine you will find another path to the left; take this and descend to Pennance Road where the estate opposite leads into Lanner via Strawberry Fields with access near the Square – from here walk back through the village to the Coppice. Route: Via Thoroughfare initially; then joining mineral trail at Carn Marth; then take quarry trail on the left at Pennance Mine to Carharrack. From the old Coal Yard (now the Animal feed store) take the Lanner Road back to the Coppice. Leave the Coppice car park, walk to the bottom of the hill and turn right; then proceed through the village to the top of the hill as far as the mineral trail at the entrance of Carn Marth. Cross the busy road to join the mineral trail which is made up of a gravel byway and follow it round to the right. 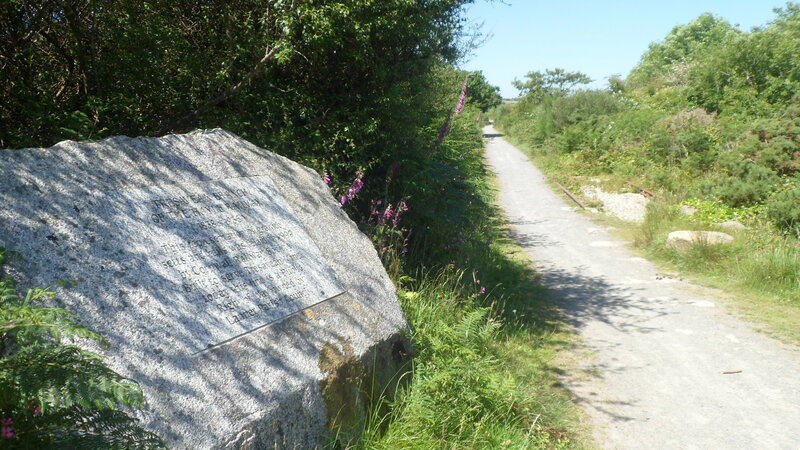 There are St Piran’s shells marking the route which is part of The Cornish Pilgrimage (Gwennap Section) and immediately ahead is Pennance Mine once served by the Redruth and Chacewater Railway (another benign mineral trail). The route does not follow this course; instead it bears left uphill towards the amphitheatre and quarry. Reaching the lake at the top of the quarry one has all round panoramic views of the Gwennap region from Carn Brea, Lanner, St Day and Carharrack. Turning right at the lake descend along the shale track to a tarmac byway. From here you can shorten the journey by continuing downhill to Trevarth and bear right to return to Lanner. Otherwise cross and rejoin the track which narrows beyond Sunrise House; a further descent takes walkers to the terraces at Carn Marth Hill. From here continue right (downhill) to Carharrack Village. On reaching the former coal yard of the Redruth and Chacewater Railway, now an animal food store, turn right and walk through Trevarth. The road is flanked by paddocks and a further mile sees the journey conclude at the Coppice Inn. Route: via Trevarth, Pennance and the village of Lanner. Leaving the Coppice car park cross carefully, bear right and walk uphill to the Trevarth sign which is next to a footpath sign post. Turning left to join the foot path open the gate and continue along a flat trail which eventually becomes an escarpment in beautiful surrounding flora which separates the paddocks which dominate this lovely section. Away to the right there are views of Tresavean and as the journey progresses the horizon takes in Carn Brea Castle and Carn Marth. After crossing several fields the path becomes a byway which continues along the perimeter of Lanner as far as Pennance Lane opposite Fiddlers Green. There are great views here and a bench at the top of the hill to rest and enjoy a moment of panorama. Continuing, the byway climbs almost to Pennance Road turning left near the top making its passage along a public right of way; continue through the housing estate locating the foot path exit near to the top of Lanner. Cross carefully to the byway marked Lanner Green which leads to a footpath entrance beside a residential property. This section takes in several fields and granite stiles until reaching its conclusion at Christ Church. At this location you will see the green with benches and of course you can savour a moment at the lovely church. Continuing from here the lane leads to Lanner Square and Inn. leaving the car park turn right and descend through the village to the Coppice. A shorter option offers a course through Pennance Parc to Strawberry Lane where a foot path takes you onto the paved thoroughfare leading into Lanner Square. Here there are shop, inn, churches post office, chip shop and bakers subject to opening times; from the latter it is little more than a ten minute walk back to the Coppice Inn where you can relax and savour the journey’s end. Route: Via Tresavean Tramroad, Carn Marth and Pennance Lane. Starting at the Coppice Inn, leave the carpark by the fence and cross the busy Falmouth Road to join the byway at Tresavean. Continue along the byway ahead which serves the Lanner Moor housing estate and at the last dwellings join the foot path which leads to the old tramroad. Follow the track as it bears right in the direction of Redruth and as the journey evolves walkers will come across old tram tracks and information boards highlighting an era of great prosperity. Lanner was barely a hamlet before the Industrial Revolution but evolved during the mining boom which saw the construction of the terraces that stand here today. The views from the tramroad are a mixture of paddocks, housing estates which make up this long village, distant seascapes and derelict tin mines. The trail is flat for most of the way reaching a junction at Tram Cross Lane; from here bear right along the lane which is marked by a brown sign ‘ Mineral Trail’. Leaving the Coppice Inn, cross the main road and join the lane to Tresavean; Flats where it joins a byway. Ascending along a gravel track pass a farm track on the left and then join a second mud track a little further on. Although wet in Winter it is accessible and takes in a small-holding of geese and Lanner Football Pitch below to the left. On the approach to Tretharrup Wollas we encounter a few potholes as the byway passes a couple of residential properties before climbing to the Gwennap/Upper Lanner Road which is little more than a country lane frequented by minimal traffic and lined with paddocks which provide a home for many local horses. Reaching a junction take the sharp right and descend along Chapel Lane to the tramroad below enjoying the wonderful views the journey affords. On reaching the Tresavean Tramroad turn right and continue along the flat track. At the next junction you will find an old railway track and placard depicting the history of the tramroad which dates from the Victorian era. The Industrial Revolution gave rise to the mining cottages built to suit the needs of this great period which saw Lanner evolve from a hamlet to one of the longest villages in Cornwall. Before this time it existed as a modest farm community visited by ancient pilgrims on their way to St Michael’s Mount. After enjoying the all round splendid views extending to the north coast on the right and Pennance Consols Mine at the foot of Carnmarth on the high ground ahead, it is time to leave the tramroad and descend back towards Tresavean and the Coppice Inn where the walk reaches its conclusion. LANNER WALKS (constructed and written by Robin Moore). A new walking club at the Coppice Inn, Lanner commences in July with a view to exploring the Local Region and its many places of interest. Each walk starts and finishes at the Coppice Inn and covers distances between 3-6 miles. Unless there is a public demand for weekend walkers we hope to commence around 10.30am on a chosen weekday. At present we have produced individual walks with a view to publishing a complete walking guide by autumn; for now each walk publication will cost £1 and we will provide a group leader, give a talk about the area and there will be an opportunity to ask questions about Robin’s worldwide expeditions and purchase the original diaries/walks and artwork associated with them. The local charity walk has been arranged for August Bank Holiday Sunday commencing around 10 am at the Coppice Car Park. We are hoping to provide entertainment for the day and ask the public to support our campaign for Cornwall Hospice Care. Passports, Guides and Sponsor Forms are available at the Coppice Inn. Guides and passports are also available at Cornwall Library Redruth and Gwennap Pit. See information below regarding passport and journey info; posters will also be distributed along with press release. ‘Hawker’s’ famous church at Morwenstow. A full guide is now available at tourist offices/Cornish Libraries – Discovering ancient and modern Cornwall. 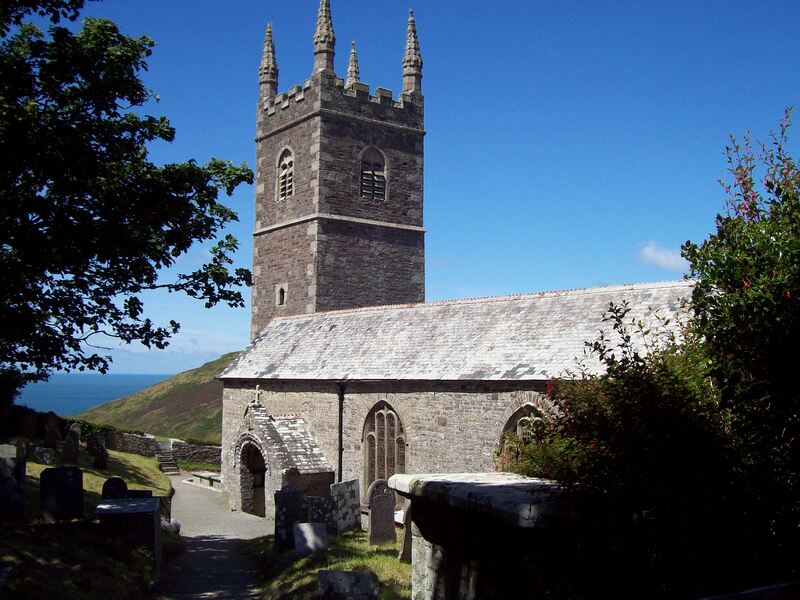 Beginning in Cornwall’s attic at Reverend Hawker’s Morwenstow Church this discovery trail follows a course from coast-to-coast to St Michael’s Mount. It takes in old tram roads, the unrelenting coast path, ancient pilgrim trails and adopts parts of modern day cycle routes of The Cornish Way. The creator of the Pilgrimage supports Cornwall Hospice care and other local charities and has walked over 30,000 miles around the world raising thousands of pounds for these organisations. Certificates from our Pilgrimage organisation and Cornwall Hospice Care are available for participants completing the journey using this passport. Stamps or signatures can be collected from the tourist offices, local churches, inns or campsites/accommodation. The route is marked by St Piran’s scallop shells, black and white tape or yellow and black tape. Single yellow tape also demarcates the Pilgrim Route. This forms a 10-mile circular walk around the Gwennap Region and is derived from Phase 8 of the Cornish Pilgrimage. This lovely walk follows a course from Gwennap Pit to Vogue (parking at The Star Inn), St Day, Carharrack, Gwennap, Trevarth, Lanner (The Coppice Inn). It takes in the Tresavean Tramroad and Carnmarth, Route 3 and local byways/footpaths. We invite you to join us on our annual fundraising walk held each August Bank Holiday Sunday Morning. See details on our website summer season newsletter. The Keltek Ale Trail (walking central Cornwall in a day) with harvest supper auction in aid of charity.